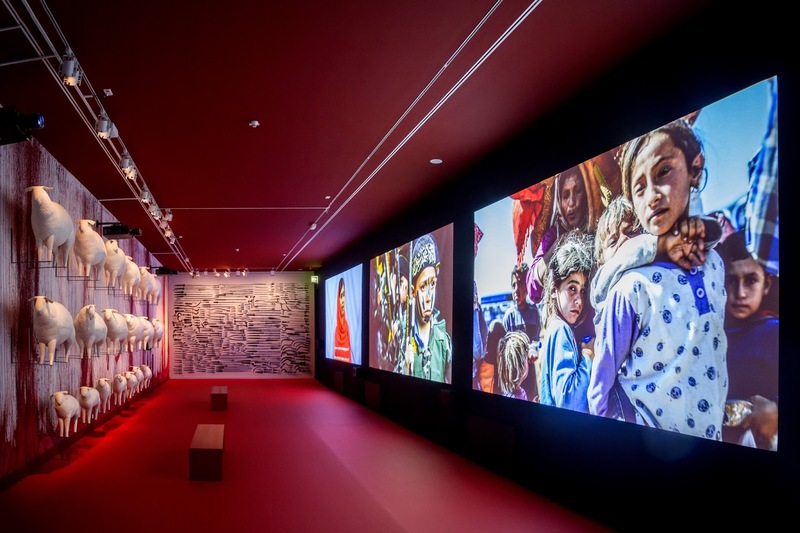 When I was asked to be a part of the exhibition at the Jüdisches Museum in Berlin we had spoken through Skype and the overall idea of the exhibit was explained to me. 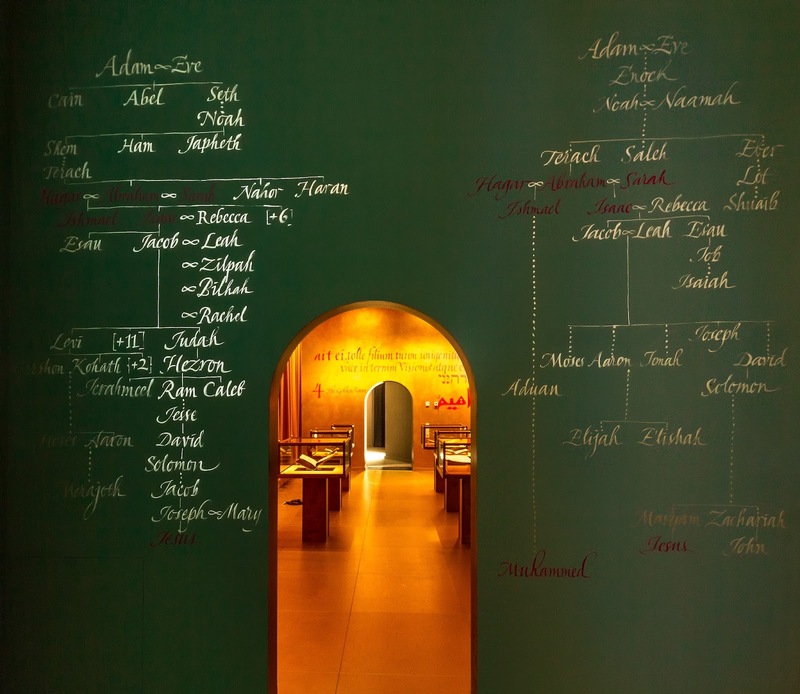 They determined that the exhibition would be of Abraham and Isaac or the Akeda as reflected through the Hebrew and Christian bible as well as the Qur'an. One of the beautiful aspects in working with Saskia Boddeke and Peter Greenaway is that they have a firm idea of where the overall exhibit should end up, but they also allow the artists to take ownership of their own artwork and give them the freedom to understand and work within their own strengths. Essentially they know what you can do and simply ask you to do it. So let me start off by saying that I am not religious. I am not against religion, it just simply was not a part of my life growing up. I had said to someone the other day that when Ebola was destroying families and lives in Africa, it was not people like me who rushed over to help those in need. The people who held the hands of dying children, at risk to themselves, often were religious. If religion can help create that type of empathy in the world then it is a good thing. However, there are also those who commit atrocities in the name of a God. When I look at religion I don't paint it with a broad brush as either good or evil, but rather recognize that there are far too many degrees of religious devotion from someone simply trying to be a good person and following some teachings from the Bible, to those who are fanatically religious to the point where it is a form of insanity. So at those times when I have been in contact with religion, be that weddings, funerals or what have you, at those times I am generally an observer. When the priest asks the room to bow their head, close their eyes and repeat a prayer I am usually in the back watching the room. So the first thing I did when I prepared to build a virtual space for the museum was to look with a bit more depth at the story of Abraham and Isaac, which I was already mildly familiar with. Essentially God wishes to test Abraham's faith by asking/commanding him to sacrifice his son Isaac. When God is convinced Abraham will do this deed his sends an Angel to stop him at the last moment. I am going to do some more posts on the story and the modernized version I wrote, but first I have to explain the initial and almost immediate issue I came across. You see, in my research I found two variations of what God said to Abraham. In one he says "Take your son, your only son, whom you love--Isaac--and go to the region of Moriah. Sacrifice him there as a burnt offering on a mountain I will show you." But then I discovered that in Hebrew it is written “kakh na”. Kakh alone is a command to “Take” but when combined with “na” it changes into a request or question “Please take” or “Will you take”. So then it could also be translated as "Will you take your son, your only son, whom you love--Isaac--and go to the region of Moriah. Sacrifice him there as a burnt offering on a mountain I will show you." To me, this was a very important distinction to make. If God commands Abraham to kill his son then that is a God with a certain type of personality trait. However if God asks Abraham whether he would kill his son for him.. then it puts the onus on Abraham to decide, and ideally to refuse to do so. And conceivably God might be pleased that Abraham did not follow his command with blind obedience. God - would you do this if I asked you? Abraham - no sorry I wouldn't do that God - good. that God commands Isaac to kill his son as a test of faith. I have been asked to explain in detail the composition of this artwork for a class, so I will do a few more posts over the next few weeks moving through the build and explaining the choice of scenes as well as the technical reason for designing it the way it is. This build in particular, had to be created to walk the line between being newbie friendly (the vast majority of visitors to the Museum have never seen a virtual space before and first must learn to walk) as well as being interesting for the experienced Second Life user who expects.. no demands a certain level of sophistication when exploring an artwork. And I will end this post with Iono Allens wonderful machinima of the work. exhibition showing both at the Jüdisches Museum in Berlin as well as in the virtual environment of Second Life. 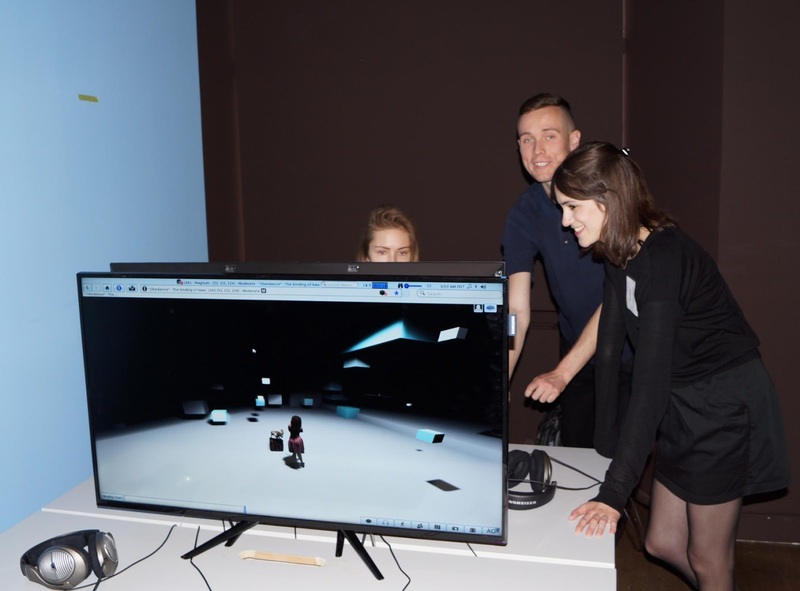 It will run until September 13th 2015 in both our virtual world on LEA 1 and at the Museum. 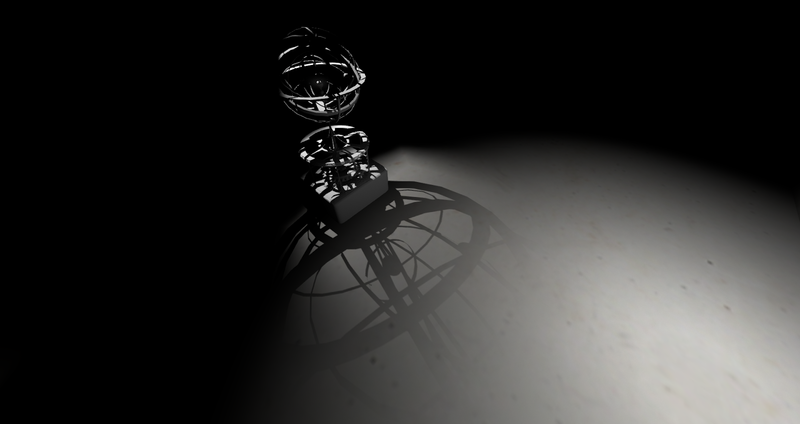 The virtual space, as seen in the trailer, was created by myself and Jo Ellsmere. 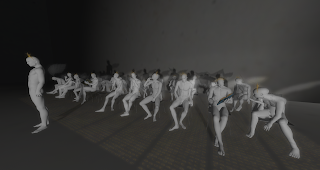 Jo's work is the wonderful bot performances you will find in the God room towards the end. 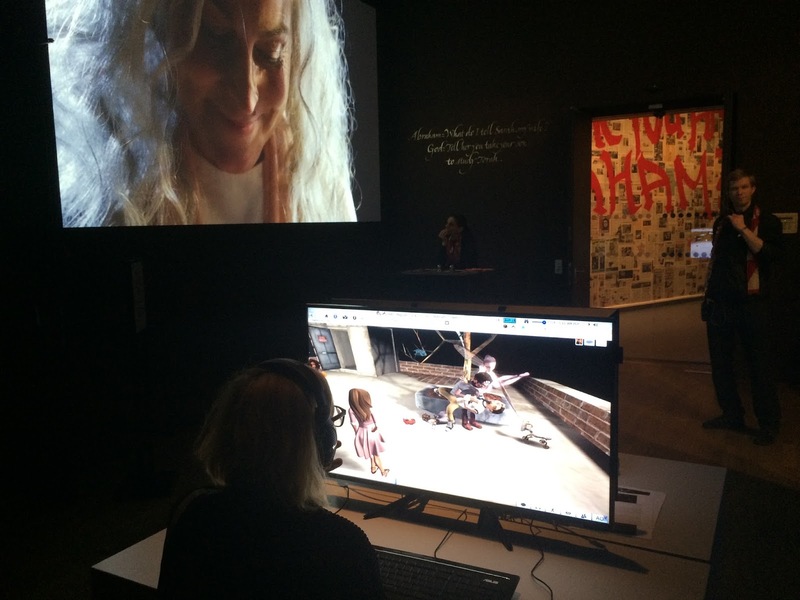 The immersive space we have created is being shown on monitors within the Museum thus allowing the guests to navigate the 3D space as part of the overall Museum installation which was the creation of Saskia Boddeke and European director Peter Greenaway. 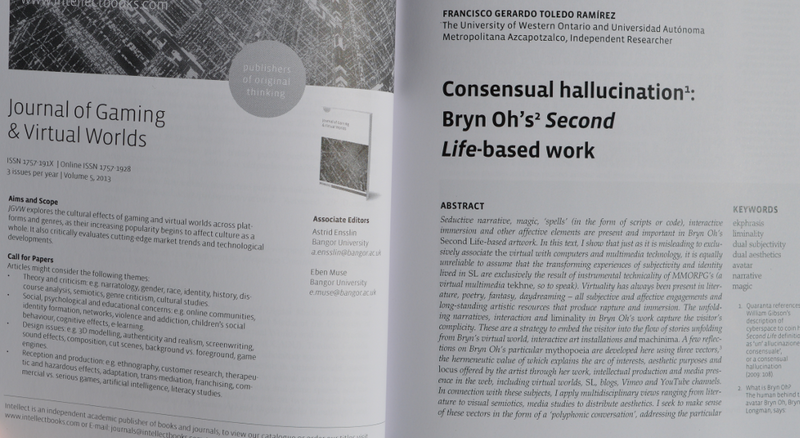 This is a very important exhibition in that it is a high profile use of Second Life as an artistic medium and its mere presence within a Museum of this caliber legitimizes the virtual space as an art medium for some, who before now may not have associated it in this way. Credit for this should be given to both Saskia and Peter who are staunch supporters and believers in this medium, they could easily have created the work without using the virtual space yet pushed the idea on the Museum directors and have them interested as well. The story for the exhibition is that of Abraham and Isaak from the Bible. The Museum space is made up of 15 rooms and reflects on the narrative in a macro viewpoint. The Second Life portion is a micro viewpoint I created which is a modernized retelling of the story. My intention was to see how we may interpret the actions if they were slightly altered and presented in a way that is more familiar to the average person, perhaps removing some of the abstraction and distancing we may get from being unable to fully associate with the characters involved. For example does our perception change if God speaks to Abraham through the flickering images of a TV set late at night? I wanted to show the relationship, the deep love and bond between a Father and son, then juxtapose that against a command by God for that Father to kill his son as a sacrifice. God prevents Abraham from killing his son, but what happens once Gods presence has withdrawn after testing Abraham's faith? How might the moments go when Abraham and Isaak are now alone and words are needed to explain? I think it is healthy to change the perspective from which we view things and hopefully the exhibit will encourage discourse and debate for those who experience it. It will of course make some people grumpy as it relates to the touchy subject of Religion, and I have used some artistic license to portray figures in ways that might not be appreciated, such as covering Gods four angels who surround him with camera lenses rather than the endless eyes as described in Revelations. But it reflects the monitoring we have in our societies, in fact I expect if I walked out my door right now I could very well be recorded on some type of surveillance. God's angels are described as being covered by eyes and to me that suggests that God sees all and is an acceptable parallel to create. Anyway you will see. When I get some images of the Museum location I will do another post and speak in greater detail of the project. The SLURL is here http://maps.secondlife.com/secondlife/LEA1/39/215/125 and you will need to set up the viewer almost the same as in the Singularity of Kumiko (the directions are at the landing point) Phototools - No Light and the shadows with projectors.. you will remember. The number of avatars permitted on the region is limited. 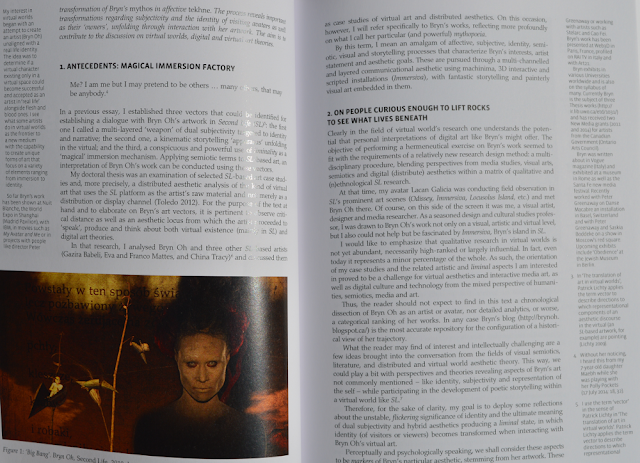 I am pleased to announce that my artwork has been featured in an academic journal in a piece written by Dr. Francisco Gerardo Toledo Ramirez. I read the work and thought to myself... Don't I sound like an interesting person?... from this day forth I must endeavour to keep my mouth closed so as not to dispell this wonderful illusion. Below is a description of the journal and its goals. 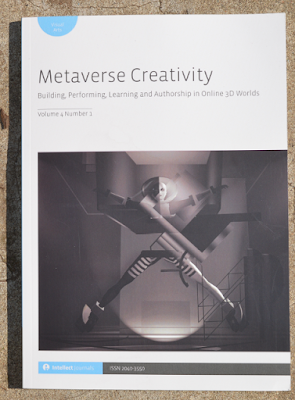 Metaverse Creativity: Building, Performing, Learning and Authorship in Online 3D Worlds is a referenced journal focusing on the examination of creativity in user-defined online virtual worlds such as Second Life®. While such creative activity includes artistic activity, this definition should in no way be limited to artistic output alone but should encompass the output of the various disciplines of design - such as fashion and object design, landscaping and virtual architecture - that are currently all amply manifest in Second Life®. 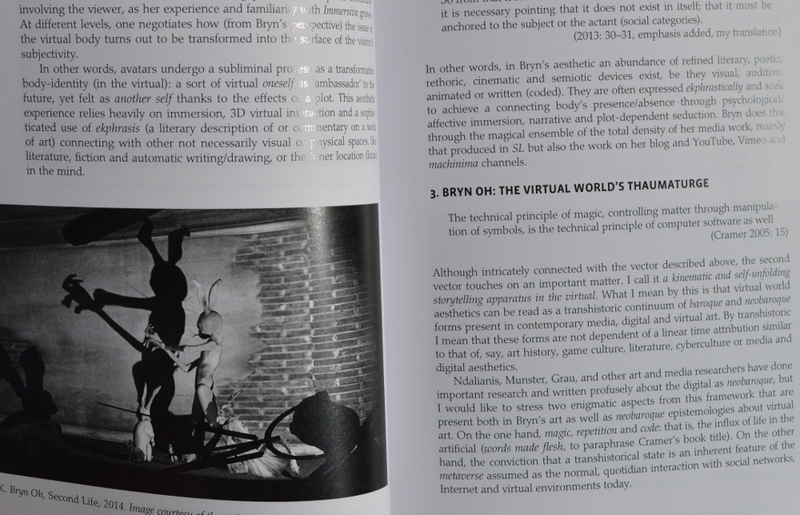 "the focus of this journal is an examination of the prolific creative activity in the metaverse – from art, design and architecture to research and education to play and entertainment." I have since been asked to be on their board of directors and my role there essentially would be to direct the various professors, curators and writers that I seem to come across, to them. So if you have an interest in being published then they will be happy to have a look at your work. I am including a link below with the submission guidelines. 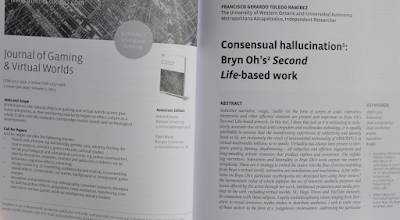 If you are a professor or simply have an interest in reading some really great pieces on our this fairly new contemporary medium then check one of those links and there is some info on purchasing the book or articles by PDF.